Until then, though, I’m just getting my apple fix via Chobani yogurt. I like to tell myself that the apples at the bottom of their apple cinnamon Greek yogurt are NY apples, since Chobani whips up its yogurt in New York. Don’t try to tell me otherwise! I can’t tell you how delicious (and healthy!) these are. I’ve been making them in big batches and freezing them so I can enjoy them on-the-go all week long. I can’t wait to make them for my pumpkin-loving family when I am home in New York next month! 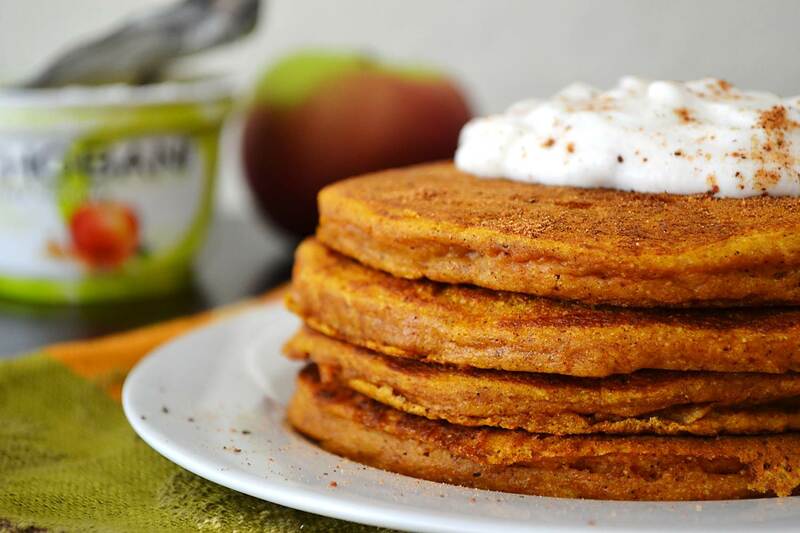 Combine pumpkin and Chobani apple cinnamon Greek yogurt for the the ultimate stack of fall pancakes. This recipe uses gluten free flours, but I’ve made them with regular all-purpose flour too (omit the ground oats, rice flour, and guar gum, replace with 1 cup all-purpose flour). Heat a griddle or large frying pan over medium heat. 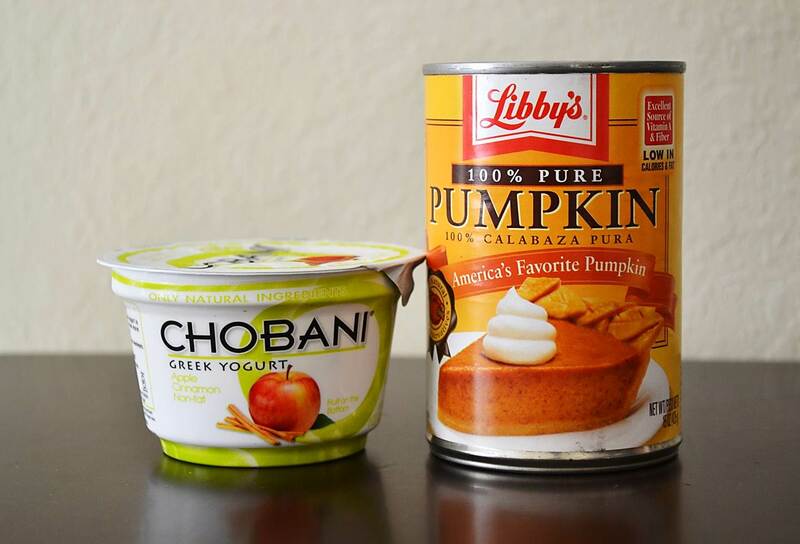 In a medium mixing bowl, stir the yogurt and eggs until combined; stir in the pumpkin. In a separate small mixing bowl, stir the flours, pumpkin pie spice, baking soda, and salt. Add the dry ingredients to the yogurt mixture, stirring until just mixed (the batter will be thick). Previous PostMini Cinnamon Bacon Cheddar BiscuitsNext PostRunning update. i think the apple cinnamon and the mango are my two favorites chob flavors. of course i say that right now and i’ll back to loving strawb banana next week! these pancakes look great liz – as you know, pretty much ANYTHING with pumpkin is all i’m eating right now lol. Ooo yes, I love the mango too! But I think apple cinnamon fits better with pumpkin. 😉 I agree with you, I’m more or less on a pumpkin diet from now through Thanksgiving! It’s funny, the first time I tried the apple cinnamon Chobani, I didn’t love it, but now it’s one of my favorites. And perfect in these pancakes! You just combined the best two flavors of fall into one pancake. And I love you for it. Aw, thanks! I agree — apple + pumpkin = fall. I am going to make these this weekend. I love everything about this recipe especially that it’s pretty much gluten free! Saw your comment on my Facebook page — definitely grease the pan well next time — these pancakes are TOO good not to try again! the greek yogurt queen is at it again! Love that you used both greek yog AND pumpkin in these beautiful, fluffy pancakes! You should make these! You could even add some diced apples to up the apple flavor even more. Hi Greg, you can usually find guar gum (or xanthan gum, that works too) in the natural foods section of the grocery store, right by the gluten free flours. It’s a thickening/binding agent that helps keep things together when you’re working with GF flours. Of course, if you end up making them with regular flour, you won’t need it! As for the Chobani, I would reach out to them directly — I’m not sure if they sell Chobani in Canada? 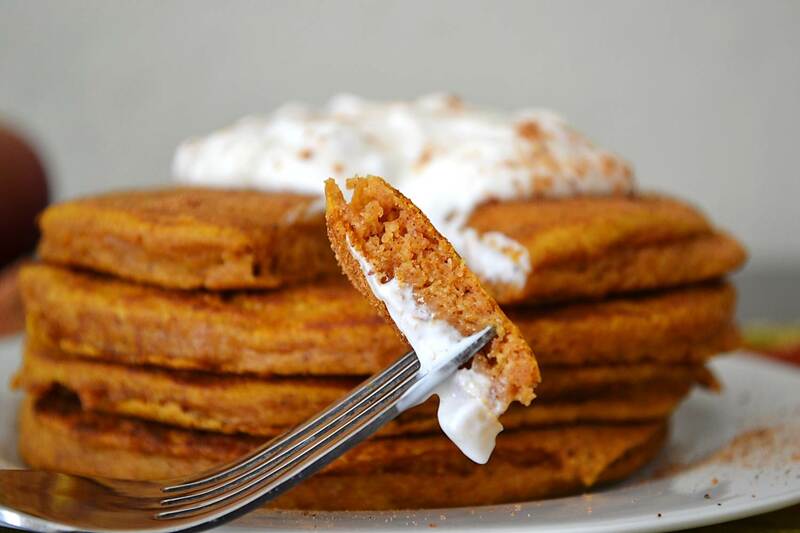 I didn’t think that pumpkin pancakes could get any better! The addition of apple is fantastic! 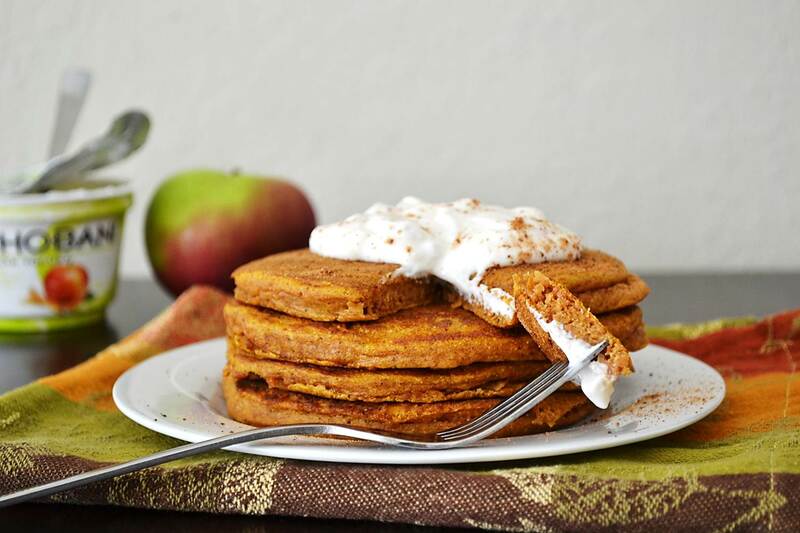 Oh yes, pumpkin pancakes just got better! That’s my fave chobani flavor so naturally I need to try these asap! They are so good, and you can really taste the apple chunks! Love the idea of these…when I tried them my pancakes were gooey. No matter how long I cooked them for….any suggestions? Hmm, I’ve made these a few times and they never turned out gooey. Are you making them with gluten free or regular all-purpose? I actually substituted the flour and just used a whole grain pancake mix and added the eggs, pumpkin, and yogurt, and some flax seed powder to the mix. Didn’t think it would cause any problems though. Hmm, I’m sorry! The only thing I can think is that maybe the pancake mix made a difference somehow. I wish I could help more! Making this tonight!! Can’t wait to try them! I love those pancakes, let me know how you liked them! They were good however I overcooked them. Since these are denser pancakes, how do I know when they are done? Hi Aly – sorry for the slow response! I use the same rule of thumb when cooking these pancakes as I do for most – when they bubble on top, and the edges look pretty dry. If you find they are overcooking, just turn the head down a smidge. Also, since the batter is pretty thick, you might need to spread it out a bit when putting it onto the pan/griddle. Hope this helps!